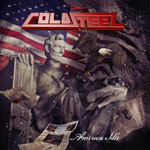 American thrash metallers Coldsteel is yet another band resurrected from dormancy and this actually without any true original members. Vocalist Troy Norr and guitarist Joe Shavel were however in the ranks when their debut EP was released back in 1988. That's pretty much what I have learned about this band after getting my hands on America Idle. In all honestly, my hopes weren't too high when I decided to listen to this release, hence a pleasant surprise when I became aware of some of the song's excellence and brilliance. This is rather cool thrash metal following most older standards, without any brutality and with a vocalist that actually sings and leaves most screams, roars and growls to rest. In my book, it doesn't feel totally dated, even if it probably is in many people's ears. We heard most of it before, but the songs' massive quality weights in favor over originality. The bass sounds pretty much like it did in the eighties and not like an additional rhythm guitar which often is the case in nowadays faster metal. More doesn't always equal better. I hear a lot of Anthrax in several songs and also some parts with a lighter Metallica sound. This without being total rip offs though. Blink Of An Eye, with a good riff and standard factory made drum fills, together with faster track Blood Secrets are my two absolute favorites, even if I indeed dig all songs. If this EP would have been extended to a full length album with songs at this level, my rating would probably have ended up at a great 8. Five songs and twenty-two minutes of playing time are however not enough for that grade, so I stay at a very good 7.